It’s not often you get to hang out with a legend – well, OK, there was that five minutes backstage with Obama at the ATD-ICE Conference last May – but in Taipei in December I had the great privilege to spend some genuine quality time with John H ‘Jack’ Zenger, without question one of both the great thought leaders and practitioners in the domain of Leadership development and training. Once again ATD provided the backdrop; I was in Taiwan to deliver the opening keynote at the organization’s Asia Pacific Conference and Exhibition. I had been invited to speak on the topic of Learning Innovation for the Future, but my greatest learnings came not from the future but from the past, I do have to say. Why? Because ATD had partnered with great Taiwanese tech organization The Institute for Information Industry, whose mission is to both promote the local information industry and develop an information society. ATD and the Institute had together recruited 600 energetic and curious participants in a dialogue about workplace learning in ever-productive and super-focused Taiwan, and I was delighted to share the stage with a great line up of diverse local and international presenters to do just that, including Sophia Tong, CEO of the Testright Group, Thai academic Saowaruj Rattanakhamfu, Predictive Learning Analytics guru Ken Phillips, and Amy Cheng, HR Lead for Microsoft Taiwan, amongst many others. Great line up, great energy, and great conversations were started (and will continue I hope), but it was with Jack that the bandwidth was most intense for me. 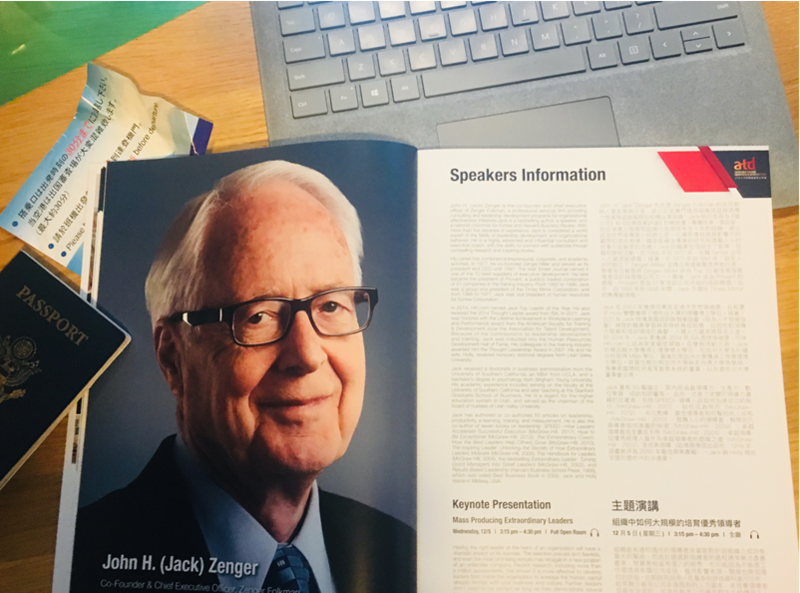 Currently the CEO of Zenger-Folkman where he is still, at the age of 87, very much a hands-on operator, Jack still thinks deeply about industry trends. 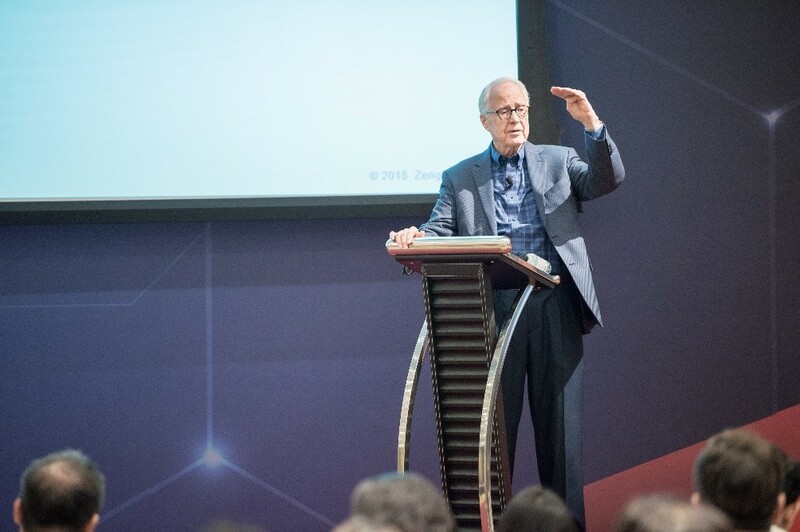 He was also one of the most relaxed and compelling speakers I have seen, exuding the confidence but absolutely the passion of someone who’s focused five decades of their professional life to helping people become better leaders (and how to make ‘em). He has founded and run a number of companies, taught at Stanford, and authored 13 books, but perhaps his most significant contribution to our field is that reliable workhorse of leadership training, the 360-degree feedback tool. Also sometimes called a multi-rater feedback, 360 is a process to generate feedback from an individual’s team including their subordinates, colleagues, and supervisor(s), and possibly people outside of the organization, e.g. Customers, as well as a self-evaluation by the employee themselves, thus collecting a set of feedback from a full spectrum of the people whose work you affect. Familiar enough now, sure – but what we tend to forget is how radical this was a as a departure from the traditional exclusively downward flow of feedback traditionally used to coach on work behavior and performance by managers. There are now studies that question the impact of the multi-rater approach that point out potential confounding variables, implicit bias based on role relationship, and the potential manipulation of feedback rankings; nevertheless, the tool is a frequently used component of many programs, including one taken by your humble correspondent. At the conference, Jack delivered a masterclass on how to implement a comprehensive leadership program in six steps. What Jack stressed was the absolute critical importance of firing on all six of these cylinders at once, as it ‘requires deliberate and sustained effort.’. That was all fascinating enough, but in discussion afterward he shared an observation (maybe, a fear?) that in the face of the uncertainty and perceived imminent disruption and change in the workplace of the Fourth Industrial Revolution (see our recent post on this here), organizations seem to be in danger of fumbling the ball, with not enough Big Picture work or thinking going on. For example, I asked Jack what changes he’s seen over his professional life relating to leadership coaching, and if the Information Age has fundamentally changed what great leadership looks like. He told me that he thought at all organizations have and will always thirst for leadership, but that a few stars at the top of an organization has never been enough. He also pointed the shift in focus from correcting weaknesses to focusing on strengths, as well as the mindset work of Carol Dweck et al as vital recent contributions to this debate. One of the things that struck me most about Jack’s work is how data driven it is. In our field, sure, there is an obsession with using data to prove ROI and justify our existence and budge – but unlike the advertising industry, which has totally pivoted and embraced a data driven approach, the learning sector has so far really struggled to quantify impact and embrace the precision and rigor or a truly data driven field. By sharp contrast, Jack has quietly been amassing one of the truly great data sets on Leadership, with over one million sets of 365 feedback. Now, he and his team have set to work to derive insights and harvest detailed insights and concrete lessons on what makes great leaders great. For example, in a recent blog post, information from 11,000 workgroups in the same organization to establish a high correlation between manager ineffectiveness and employee engagement is beautifully explored, and this is surely a route of travel we should all be embarking upon together. Boy, would we at the LFG love to get our hands on that data! In the meantime, we’ve added the Zenger-Folkman blog to our regular reading list, as we now know who are the go-to folks for best-in-class leadership development programs. So, a very sincere ‘thank you Jack’ for making what was already a really fun two days in Taipei even better – and for a lifetime of service and amazing contributions to the world of leadership training and development.